The communication that really resonates is that which has emotional value and conviction. There can be humour, but talk about something that really matters to you. You won’t necessarily excite everyone, but that’s fine. Use of a script invariably kills the delivery – you need to be familiar enough with your material that you need nothing more than the slides themselves to remember your words. Speaker top tip: REHEARSE. Colin and I do this because we love it, Espresso Library host because they love it, the audience come for the same reason and the speakers… well, they’re usually pretty passionate about their subject. I always tell people to keep their communication short and sweet, and PechaKucha defines that very well. 20 slides, 20 seconds per slide. At first, it seems a stern discipline, but it’s actually a blessing. The way to make it work is to rehearse. It’s easy to see who hasn’t taken this step; they either run over into the next slide and then have to rush, or stare at the screen and wait for the next slide to appear. Speaker top tip: REHEARSE. Again. PechaKucha say that they want each event to have enjoyable variety like a box of chocolates, and I think our line-up of speakers really delivered that engaging mixture. We had talks on photography, Down’s syndrome, robots, growing old, in fact all the presentations were on thought-provoking and inspiring subjects, delivered with enthusiasm and with great imagery. It’s wonderful to be inspired when you’re one of the people putting the whole thing together. We – the organisers – also had a few surprises in terms of technical issues, which were not good surprises (but entirely our own fault), but which kept us on our toes. At every event we learn some more. Organiser top tip: PREPARE CORRECTLY AND HAVE BACK-UP PLANS. 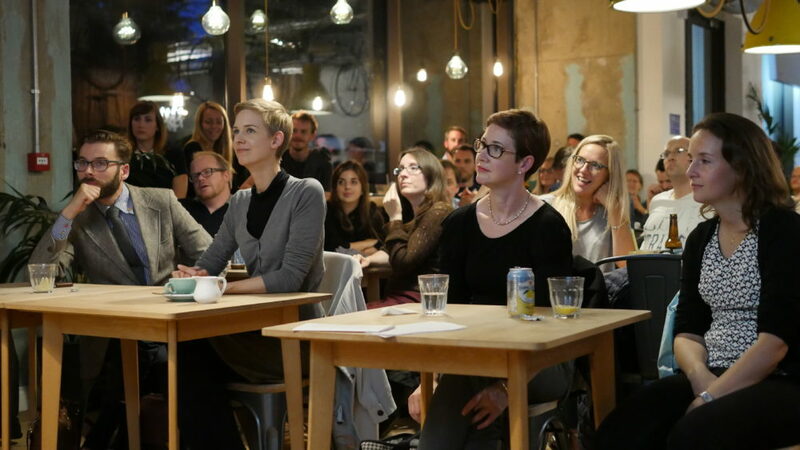 I recommend attending a PechaKucha Night to see how you can deliver presentations in a way that’s better for your audience plus an excellent discipline for you as a speaker. Next week: the first post for my new video series ‘Presentation Fails and How to Fix Them’!